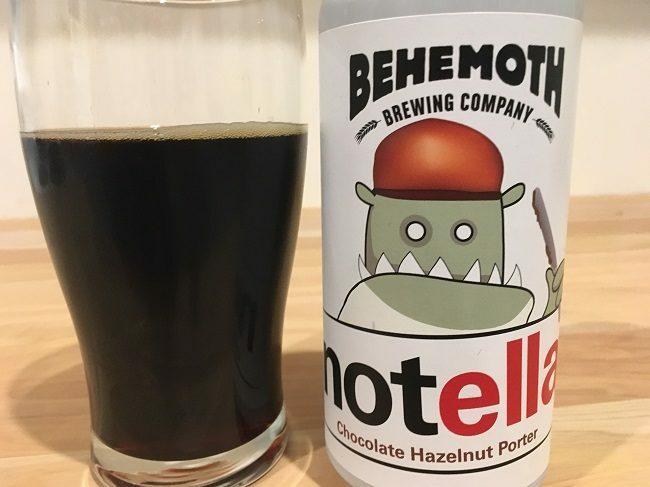 When I heard that Kiwi craft brewery Behemoth had brewed a Notella Chocolate Hazelnut Porter, I had to try it – not because I’m a fan of the choc-hazelnut spread from which it gets its name (I actually hate Nutella) but because I’m a fan of trying new and interesting brews. Blurb on the can: Ever put your finger into a jar of Chocolate Hazelnut spread (or a spoon if you are feeling fancy) just for a hit of that chocolate hazelnut goodness? Well, you are probably reading the right can then. We have made a big, luscious bodied porter and loaded it with chocolate and hazel-nutty goodness. If you are feeling extra indulgent, try one of these cans with a slather of some Chocolate Hazelnut spread. We won’t tell you which brand to buy. Behemoth Brewing Company: This Kiwi brewery was born out of a hobby, which quickly turned into an obsession, then into a life dedicated to good beer. According to the blurb about the brewery on the can, the only thing Behemoth Brewing Co. takes seriously is bigger tasting beer. Taste test: I pull the tab, pour the thick black liquid into a beer glass, and I’m immediately repulsed by it. Not only do I hate Nutella, but I don’t even like hazelnut, and that’s exactly what this beer smells like. Fans of the nut would approve of the aroma, I’m sure. Fortunately, it tastes a lot better. The chocolate really comes to the fore, and a toasted malt backbone keeps the hazelnut well in the background. It’s smooth and bitter, blacker than a serial killer’s heart, and you can really feel the alcohol working its magic as you drink this one. It’s got some bite. The verdict: Behemoth’s Notella Chocolate Hazelnut Porter is delicious, but that’s obviously coming from someone who doesn’t approve of the weirdly popular spread that it’s supposedly based on, which makes me wonder if the myriad of people who are fans of it would like this beer. For me, though, it boasted the right amount of choc-hazelnut sweetness, making it just about the perfect dessert beer.